Disclaimer: Quantum Day does not endorse or promote Starbucks and holds no relationship with its commercial suppliers or distributors. The report is based on research presented to The American Chemical Society. The School of Energy and Environment at the City University of Hong Kong has recently started collaborating with coffee retailer giant 'Starbucks Hong Kong'. The partnership, which was facilitated by the NGO the Climate Group, will focus on the valorisation of spent coffee grounds and unconsumed bakeries via bio-processing. The collaboration is based on a support scheme and part of the "Care for our Planet" campaign: for every set of Care For Our Planet Cookies Charity Set sold, Starbucks will donate HK$8 to the School of Energy and Environment of City University of Hong Kong to support research on valorisation of food waste for sustainable production of chemicals and materials. The aim of the research is to valorise the disposed coffee grounds and unconsumed bakeries to bio-plastics and detergents ingredients, facilitating the development of biomass use in Hong Kong and reduce the release of greenhouse gases and other air pollutants into the atmosphere. The Hong Kong Starbucks project will focus on the use of acidic hydrolysis of non pre-treated spent coffee grounds and bakery waste, followed by fungal solid state fermentation for breaking down the carbohydrate into simple sugars for the subsequent succinic acid fermentation. One of the critical issues to be solved is to overcome the inhibitory compounds which affect the growth of Actinobacillus succinogenes, which is a facultative anaerobic bacterium used in the fermentative production of succinic acid. This research was presented at a meeting of the American Chemical Society. With 1.3 billion tons of food trashed, dumped in landfills and otherwise wasted around the world every year, scientists today described development and successful laboratory testing of a new "biorefinery" intended to change food waste into a key ingredient for making plastics, laundry detergents and scores of other everyday products. Their report on a project launched in cooperation with the Starbucks restaurant chain - concerned with sustainability and seeking a use for spent coffee grounds and stale bakery goods - came at the 244th National Meeting & Exposition of the American Chemical Society. Thousands of scientists and others are here this week for the meeting of the world's largest scientific society, which features almost 8,600 reports on new discoveries in science. The idea took shape during a meeting last summer between representatives of the nonprofit organization called The Climate Group and Lin at her laboratory at the City University of Hong Kong. The Climate Group asked her about applying her transformative technology, called a biorefinery, to the wastes of one of its members — Starbucks Hong Kong. 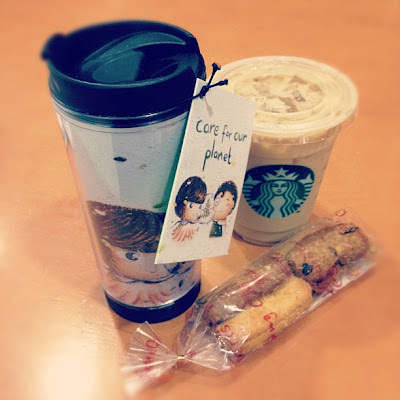 To help jump-start the research, Starbucks Hong Kong donated a portion of the proceeds from each purchase of its "Care for Our Planet Cookies" gift set. Lin's team already had experience in developing the technology needed to do it - a so-called biorefinery. Just as oil refineries convert petroleum into fuels and ingredients for hundreds of consumer products, biorefineries convert corn, sugar cane and other plant-based material into a range of ingredients for bio-based fuels and other products. "We are developing a new kind of biorefinery, a food biorefinery, and this concept could become very important in the future, as the world strives for greater sustainability," Lin explained. "Using corn and other food crops for bio-based fuels and other products may not be sustainable in the long-run. Concerns exist that this approach may increase food prices and contribute to food shortages in some areas of the world. Using waste food as the raw material in a biorefinery certainly would be an attractive alternative." Lin described the food biorefinery process, which involves blending the baked goods with a mixture of fungi that excrete enzymes to break down carbohydrates in the food into simple sugars. The blend then goes into a fermenter, a vat where bacteria convert the sugars into succinic acid. Succinic acid topped a U.S. Department of Energy list of 12 key materials that could be produced from sugars and that could be used to make high-value products - everything from laundry detergents to plastics to medicines. In addition to providing a sustainable source of succinic acid, the new technology could have numerous environmental benefits, Lin explained. For example, Starbucks Hong Kong alone produces nearly 5,000 tons of used grounds and unconsumed waste bakery items every year. Currently, this waste is incinerated, composted or disposed of in landfills. Lin's process could convert these piles of foul-smelling waste into useful products, getting trash off the land. By avoiding incineration, fewer pollutants enter the atmosphere. In addition, the carbon dioxide that is produced is reused during the biorefining process. Because succinic acid and its products (such as bio-plastics) are made using bakery waste as a renewable feedstock, they are sustainable alternatives to products (such as regular plastics) that are now made with petroleum, a fossil fuel that is nonrenewable. The method isn't just for bakery waste — Lin has also successfully transformed food wastes from her university's cafeteria and other mixed food wastes into useful substances with the technology. Lin said that the process could become commercially viable on a much larger scale with additional funding from investors. "In the meantime, our next step is to use funding we have from the Innovation and Technology Commission from the Government of the Hong Kong Special Administrative Region to scale up the process," she said. "Also, other funding has been applied to test this idea in a pilot-scale plant in Germany."